Landmines kill or maim 12,000 people each year, many of them children. They also kill hundreds of thousands of animals. Worldwide, the most common way of detecting landmines is for people to probe the ground with long pointed sticks at a 45-degree angle to try to find the mine without activating the detonator. If that sounds like a slow and dangerous process, it is. Using this method, a person can search only about 50 square meters per day. 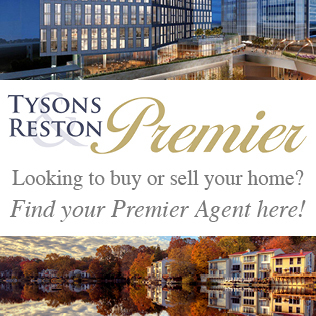 A non-profit organization based in our area has a better way. The Marshall Legacy Institute (MLI), a humanitarian organization headquartered in Arlington, provides highly trained Mine Detection Dogs (MDDs) to war-torn countries to assist with this life-saving task. With their superior sense of smell, dogs can sniff out explosive materials even underground and in plastic or metal containers. Dogs can cover a much larger area than people alone, approximately 1,500 square meters per day, and using dogs is safer as well. 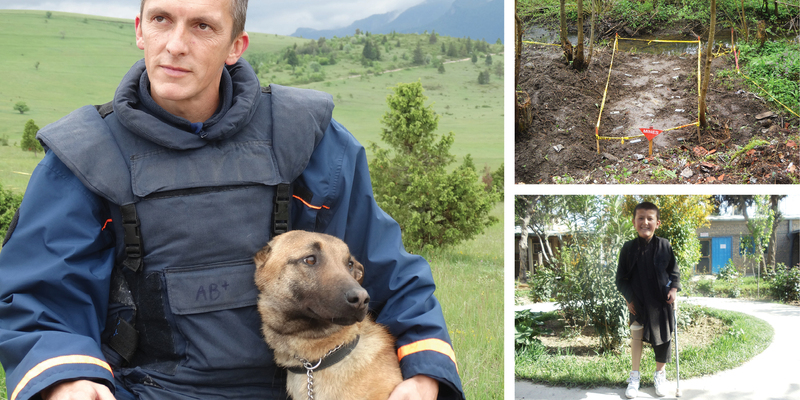 MLI’s dogs have helped clear more than 10,600 acres of mine-contaminated land, and none of the dogs has been killed or injured by a landmine. 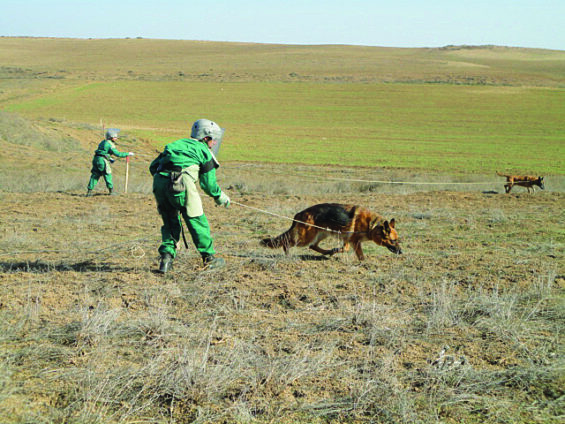 Handlers working with MDDs in Bosnia Herzegovina. Dino, an 11-year-old Belgian Malinois, spends most of his days in the MLI offices. Dino worked as an MDD in Afghanistan for eight years before his retirement and adoption by MLI’s executive director, retired Army Col. Perry F. Baltimore III. Dino likes to keep busy, so when he’s not in the office, he’s often visiting schools, scout troops and community organizations with Baltimore to demonstrate his mine detection skills. Belgian Malinois and German Shepherds are particularly well-suited to the work of mine detection because they are highly intelligent and eager to work. Dogs with longer snouts also have a better sense of smell than other dogs. For example, German Shepherds have 225 million scent receptors compared to 125 million for a dachshund and just 5 million for a human. The dogs are motivated to work by the strong relationship they have with their handlers. And like all dogs, they are motivated by the rewards they receive after a job well done, such as praise and time with a favorite toy. Things that keep the work fun. Using dogs for land mine detection does have some limitations, according to Baltimore. “It’s too hard for them to work on steep slopes, and if it’s too wet outside, the scent of the explosives washes into the ground. If it’s too windy, the dogs can’t tell where the scent is coming from,” he said. MLI partners with the K9 Global Training Academy for Working Dogs in Somerset, Texas, to obtain dogs for the program from reputable breeders in Europe. The academy’s founder, Dan Hayter, and his team travel to the breeders to meet the dogs and can quickly determine which ones might have what it takes for this type of work. The dogs go through an intensive four-to-five-month training program starting when they are 12 to 18 months old. After graduating from the program, a dog travels with a trainer to the country of assignment. The trainer works as a field supervisor with the dog and the local handler to help them form a bond, staying on site for at least a year. The team of dog and handler go through a rigorous certification exam to meet standards set by the International Mine Action Authority. Depending on where the dog is working, additional standards may also be required, and the team must be re-certified annually. Usually, the handler and the dog develop such a close bond that the handler adopts the dog when it retires. In cases where that is not possible, MLI is notified and finds a home for the dog. MLI Executive Director Perry Baltimore conducts an MDD demonstration. MLI was founded in 1997 to recognize the 50th anniversary of the Marshall Plan, America’s economic recovery plan to aid Western European countries following World War II. At the time the newly formed Institute was trying to determine how to help countries recovering from war, Princess Diana was focusing the world’s attention on the devastating effects of landmines. She made highly publicized trips to Angola and Bosnia in 1997. One of the first places MLI sent dogs was Lebanon. “The Lebanese armed forces and the de-mining organization were skeptical, but they undertook a pilot program with two dogs. They soon requested more dogs, and we sent six more. In another six months, we sent six more,” said Baltimore. To date, MLI has sent a total of 32 dogs to Lebanon. To acquire, train and deliver a certified MDD costs $25,000. To date, MLI has donated more than 200 dogs to 11 war-torn countries. The organization relies on donations to support their life-saving efforts. MLI encourages families, community groups, companies and others to sponsor dogs. Sponsors not only get a tax deductible donation, but they name the dog, receive quarterly updates and photos, receive before and after photos of the land and the de-mining’s impact on the community, and donors also have the opportunity to visit and see the dog at work. Baltimore and his classmates from the U.S. Military Academy sponsored a dog in honor of four classmates who died in Vietnam. They named the dog Nam. “This way, we continue to have, if not boots, then paws on the ground to help,” he said. In 2003, MLI launched its Children Against Mines Program (CHAMPS), an educational outreach program that gets students involved in the effort to rid the world of landmines. Diana Enzi, wife of Senator Mike Enzi (R-WY), introduced the program to Wyoming school children. She thought if each of Wyoming’s 80,000 school children gave a quarter, that would be enough money to sponsor an MDD. The effort in Wyoming actually raised enough for two dogs. They named the first one Wyoming. Baltimore would like to get more of the schools in our area involved in the CHAMPS program, especially with the 70th anniversary of the Marshall Plan approaching. Although MLI is best known for its MDD program, it also is dedicated to helping those injured by mines, especially children, through its Survivor’s Assistance Program. The Institute provides medical care, prosthetic limbs and vocational training to mine victims. MLI needs donors to sponsor these survivors. MDD Betsy working with her handler Alden in Bosnia Herzegovina. There is no way to calculate how many lives have been saved by MLI’s de-mining efforts, but de-mining has an enormous impact on the surrounding community. After the land has been cleared, it can once again be used for farming, pastureland, access to work, markets, water and schools. “There is more work to be done,” said Baltimore “We would like to start a program in Columbia, and Serbia has been expressing interest. Other countries like Armenia and Lebanon have dogs that are ready to retire, and they need replacement dogs.” Unfortunately, tens of millions of landmines contaminate more than 60 countries, and more landmines are laid every day. To learn more or to donate visit www.marshall-legacy.org or call (703) 243-9200.